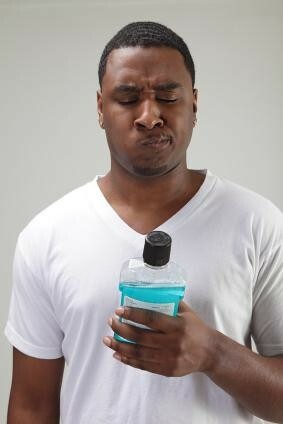 Does Alcohol-Based Mouthwash Aid in Treating Gum Disease? A lot of people have spoken for years about using alcohol-based mouthwash as a way of clearing away the bacteria in the mouth responsible for gum disease. There were even old wives' tales that said it could cure gum disease. The truth is, if you use alcohol-based products, or drink a lot of alcohol, you are more susceptible to getting gum disease than most. Alcohol does a lot of damage to your mouth, but the thing it tends to do most is dry your mouth out. This can increase the damage gum disease can do. Gum disease needs professional treatment to get better, not some alcohol out of a bottle. Even if the bottle is meant to help you take care of your mouth better, if it has alcohol in it, you aren't likely to find good results. Alcohol dries out all of the tissues of your mouth, from your lips down to your throat, and everything in between. This helps the gum disease flourish. Saliva helps keep a lot of the bacteria levels down. Without the saliva in your mouth, the bacteria can grow without much to stand in their way. Drinking alcohol slows, and in some instances, stops saliva production, at least for a bit of time. This means that your gum disease can actually rebound and get worse with alcohol around. When you want to get a mouth that is free of gum disease, you want to avoid alcohol in every way possible. Come in to our offices and let us help you begin the right type of treatment to help you rid your mouth of gum disease, once and for all. We can show you the proper tools and products to use to help you successfully return your mouth to a healthy state.